With such a lengthy history steeped in rich culture and traditions, it should come as no surprise that Southeast Asia is home to some of the most impressive temples in the world. After all, this is home to the world’s biggest Buddhist temple, the largest religious monument on the planet, and some of the most colourful, bejewelled structures you might ever lay eyes on. Even better, each temple offers a glimpse into the past and the glorious empires that once ruled the region. For all the archaeology and history buffs out there, we challenge you to tick these incredible temples off your bucket list. It doesn’t get much bigger or better than Angkor Wat in Cambodia. This massive Hindu/Buddhist temple complex was built in the 12th century and is the world’s largest religious monument. The main temple has beautiful bas-reliefs along the inner walls depicting Hindu mythological stories, and the center courtyard sports stunning sandstone towers with carved rooftops, doorways, and staircases. Spreading out from the main temple for about 400 square kilometres there are hundreds of smaller temples, each with unique features. We suggest setting aside at least a few days to explore as much of the complex as you can. Entrance fee: For non-Cambodians the fee is USD $37 for a 1-day pass, USD $62 for a 3-day pass, and USD $72 for a 7-day pass. Cambodians can enter for free. Best time to visit: The months between November and March are typically dry and not as humid as other times of the year, making this the ideal time to trek around the temples. Built in the 9th century, Borobudur is the largest Buddhist temple in the world. In its heyday, thousands of monks and laymen would make pilgrimages here, but it was later abandoned for unknown reasons. The temple lay hidden under the jungle for centuries until the Dutch ‘rediscovered’ the temple in the 1800s. Today people from around the world flock to see this awesome UNESCO World Heritage Site. Follow the corridors and staircases carved with Buddhist reliefs and you eventually reach the top with its impressive stone stupas and sweeping views of valleys and volcanoes. Entrance fee: IDR 450,000 for non-Indonesians, IDR 190,000 for non-Indonesian students, IDR 30,000 for Indonesians. Best time to visit: The dry season in Yogyakarta runs from April to October. If you’re in Penang, you can’t miss Kek Lok Si (The Temple of Supreme Bliss). This is the biggest Buddhist temple in Malaysia and one of the most colourful. Perched on a hillside, the temple features a seven-storey main pagoda with wedding cake-like tiers, as well a sprawling complex of brightly-hued pagodas, bell towers, shrines and prayer rooms built in a mix of Chinese, Thai, and Burmese architectural styles. The main attraction is the 36-metre bronze statue of the bodhisattva Kuan Yin that sits on top of the hill and is surrounded by 100 smaller Kuan Yin statues. Entrance fee: Entrance to the temple grounds is free, but you must pay MYR 2 to visit the pagoda and MYR 2 each way on the Sky Lift. Best time to visit: The dry season in Penang runs from January to April. However, January and February can be quite busy with loads of tourists on Chinese New Year holidays. 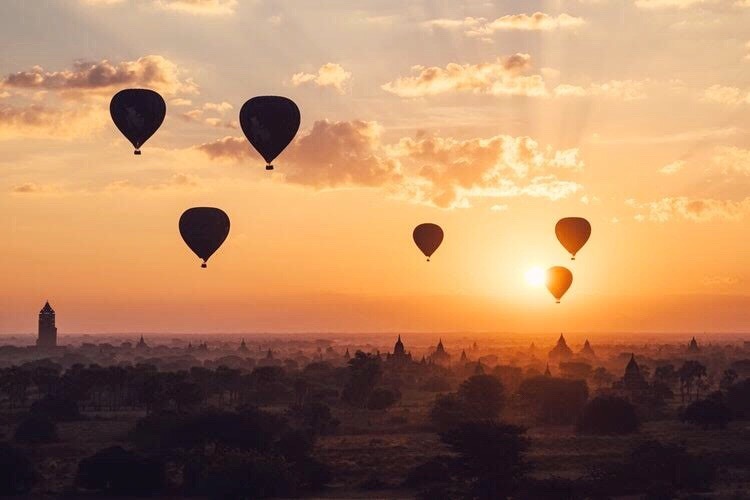 Bagan is the ultimate Southeast Asia temple experience with thousands of Buddhist stupas, pagodas, and spires spread out across the plains of central Myanmar. It would take months to visit each of the 2,000-plus temples here, but a few of the biggest and most important include the sacred Ananda Temple, the Shwesandaw Temple where locals and tourists alike gather each night to watch the sunset over the temple-studded landscape, and the eccentric Dhamma Yangyi Temple, built by King Narathu to absolve the royal leader of his sins for killing his wife, father, and brother. Best time to visit: The dry season in Bagan runs from November to February. Temperatures are also slightly cooler during these months. Nestled on the slopes of sacred Mount Agung, Pura Besakih is the holiest temple in Bali. Also known as the ‘mother temple’, the Hindu complex is spread out over six tiers that make their way up the side of the volcano. On each tier you will find courtyards surrounding 23 different temples. The main temple is located at the top of the complex and includes striking multi-tiered meru towers. Interesting fact: when Mount Agung erupted in 1963, the lava miraculously bypassed the temple, which is proof to the Balinese that the temple truly is sacred. Best time to visit: The dry season in Bali typically runs from March to October. However, keep in mind that the months of July and August are high season, so tourist sites like Besakih are often very busy. Located 17 kilometres outside Kuala Lumpur, the Batu Caves are set in a limestone hill that is bordered by the Sungai Batu river. There are a number of caves here that feature ornate Hindu paintings, statues, and shrines, but the biggest is the Temple Cave. To get there you must climb 272 concrete steps, which is no small feat, but worth the effort to see the beautifully decorated shrines set under the cave’s soaring ceiling. 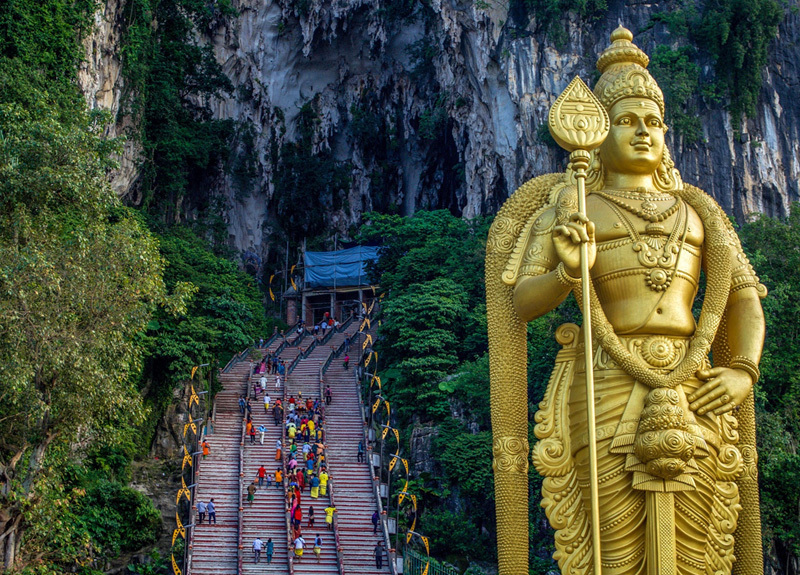 If you want a taste of local culture, visit during the Thaipusam festival when thousands of Hindu pilgrims converge on the cave to make offerings to the gods. Best time to visit: The weather in Kuala Lumpur is typically cooler and drier between the months of December and February. Thaipusam takes place in late January or early February, and while it’s definitely an interesting time to visit, the crowds can be colossal. 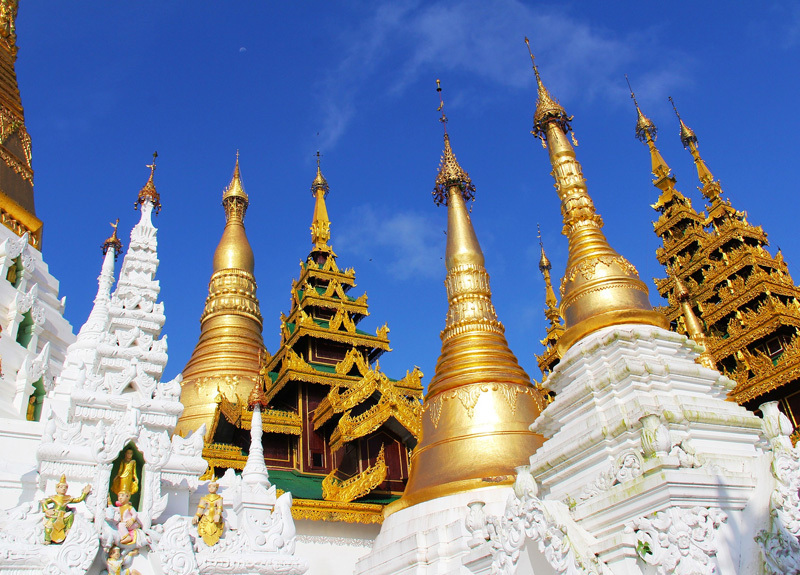 Rising above the hustle and bustle Yangon, Shwedagon Pagoda is the most sacred Buddhist pagoda in Myanmar, and a sight to behold with its gorgeous gilded stupa. The Golden Pagoda is said to hold relics of the four most recent Buddhas including eight strands of hair from Gautama. Walk around the complex and you’ll find vibrant shrines lit up in neon lights where devotees make offerings of holy water and flowers. Most impressive is the stupa itself, which is coated in gold leaf and topped with thousands of rubies and diamonds including a 76-carat diamond at the very top. Best time to visit: The dry season in Yangon runs from November to May, but it can get quite hot and humid from March to May. The Shwedagon Festival takes place in late February or early March.